Although dust storms occur year-round on Mars, they often occur in greater numbers during certain seasons. In particular, it has long been known from Earth-based telescopic observations that the largest, global dust events (those that enshroud the entire planet) occur during the southern spring and summer. As the Mars Global Surveyor (MGS) mission began to monitor this period for the second time, particular attention was paid to local and regional dust storms in anticipation of capturing--for the first time--high spatial- and time-resolution observations of the start of a "global" storm. Throughout the month of June 2001, the MGS Mars Orbiter Camera (MOC) routinely accumulated low resolution (7.5 km/pixel) global maps of Mars on an orbit-by-orbit basis. A moderately large number of local dust storms were noted, especially along the retreating margin of the seasonal south polar CO2 frost cap and around the large and deep Hellas impact basin that dominates the southern, eastern highlands. 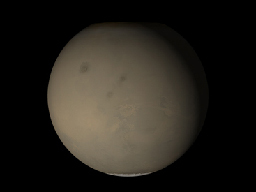 On June 21, an otherwise undistinguished small dust storm surged into the basin from the southwest. When viewed 24 hours later, the storm had circulated clockwise about 1/3 of the circumference of Hellas, indicating relatively high winds. For the next three days, this storm brewed north of Hellas and east towards Hesperia, but didn't cross the equator. Then, sometime between 2 PM local Mars time on June 25 and 2 PM local Mars time on June 26, the storm exploded north across the equator, and in less than 24 hours thereafter, dust was being raised from separate locations in Arabia, Nilosyrtis, and Hesperia, thousands of kilometers away from Hellas. This was the start of the long-anticipated global dust event. Over the following week, dust injected high into the stratosphere during the initial Hellas and Hesperia storms drifted eastward, carried by the prevailing south circumpolar jet stream. Beneath this "veil" of dust, an intense wind front moved across Mars, setting up conditions for many other local and regional dust storms. 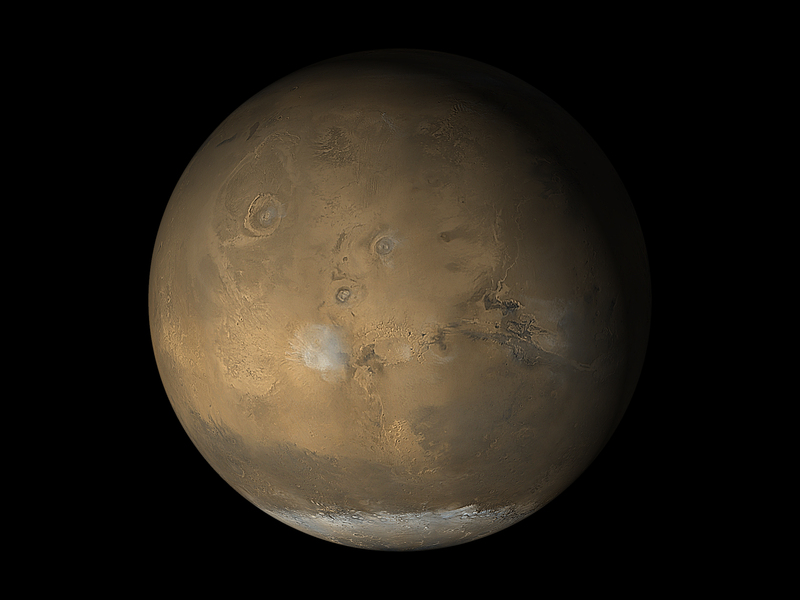 By July 4, a large regional storm was raging between Daedalia Planitia south of the Tharsis volcanoes and Syria Planum (just south of Labyrinthus Noctis). Another storm was raising plumes of dust in north-central Noachis/southwestern Meridiani. Plumes were rising in Hesperia but not Hellas. Throughout July and August, MOC observations revealed a general pattern of regional storm centers beneath an ever-spreading veil of stratospheric dust. The Daedalia/Claritas/Syria storm created dust plumes on over 90 consecutive days (see figure, below). Previous views and perceptions of global dust events had noted regional brightenings within the overall pall of what was called a "global dust storm." From our new observations, we know that at least this global dust "storm" was really a set of storms, somehow triggered to occur at the same time. We also know that dust was not raised from everywhere on the surface during this global event, but rather from discrete, long-lived centers of activity. We saw, for the first time, rapid, cross-equatorial flow of dust-raising winds. One interesting observation by the camera did not involve taking a picture. 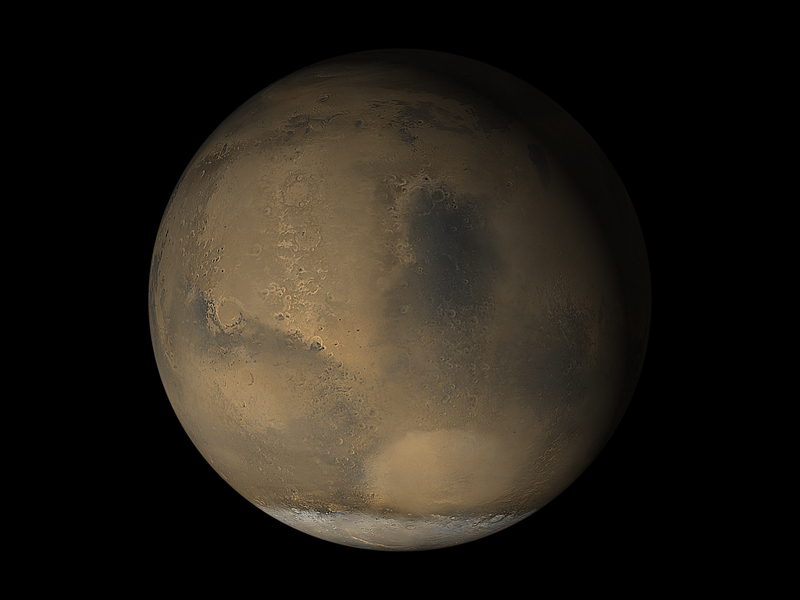 The temperature of the front end of the tube that holds and protects the telescope mirror of the high resolution camera is very sensitive to the heat emitted by Mars. 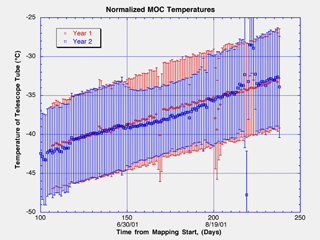 That temperature oscillates every orbit, and the average closely follows the annual temperature change as Mars orbits the sun. 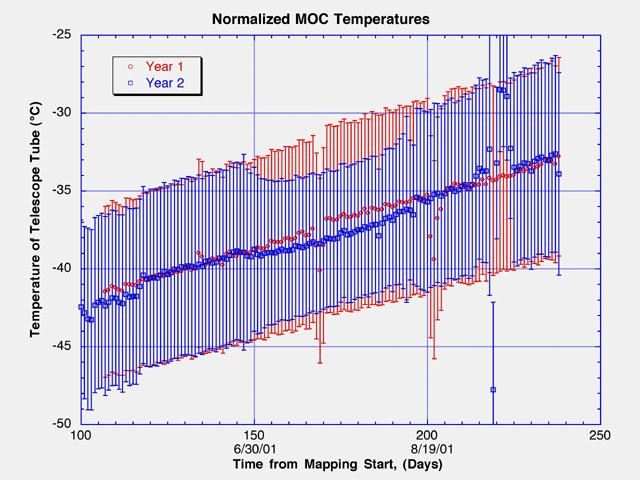 As soon as the global dust event began, the MOC temperature began to drop (see figure, below). The daily average temperature cooled about 1°C, the daytime average dropped almost 3°, and the nighttime average actually increased by 2/3°. These changes are consistent with models and theories of the influence of dust mixed throughout the atmosphere: high altitude dust reflects sunlight so that less solar energy gets down to the ground to heat it. This cools the planet during the day. Dust throughout the atmosphere also absorbs heat radiated from the surface during the day. At night, this dust is warm and radiates, increasing the heat seen from the planet. In the figure, the measurements shown in blue are those made during the global dust event of 2001 and the measurements shown in red were made exactly one Mars year earlier (when no global dust event occurred). The graph shows a close correlation with the beginning of the storm and, although the dust veil obscured the surface, the temperatures also suggest that the storm's primary climatological impact was over by mid-August, although it will take more than two more months for the atmosphere to clear. Interestingly, the effect on the climate of Mars of the global dust events of 2001 is roughly comparable to but demonstrably less than (somewhat greater in temperature, substantially shorter in duration) the effect on Earth's climate of the dust and aerosols erupted by Mt. Pinatubo in 1991. Visuals used in the NASA Headquarters Space Science Update can be seen here.